Champions offers skills videos throughout the year for athletes interested in pursuing fastpitch softball at the collegiate level. It is absolutely essential that a skills video is completed and available for college recruiters as many will determine the athlete’s ability to play at their school based on the skills video. Our videos have garnered much praise by major Div 1 schools. Champions offers skills videos throughout the year for athletes interested in pursuing fastpitch softball at the collegiate level. It is absolutely essential that a skills video is completed and available for college recruiters as many will determine the athlete’s ability to play at their school based on the skills video. Champions has teamed up with Top Prospect Network, Inc. to bring our clients the latest innovations in Student Athlete Recruiting. 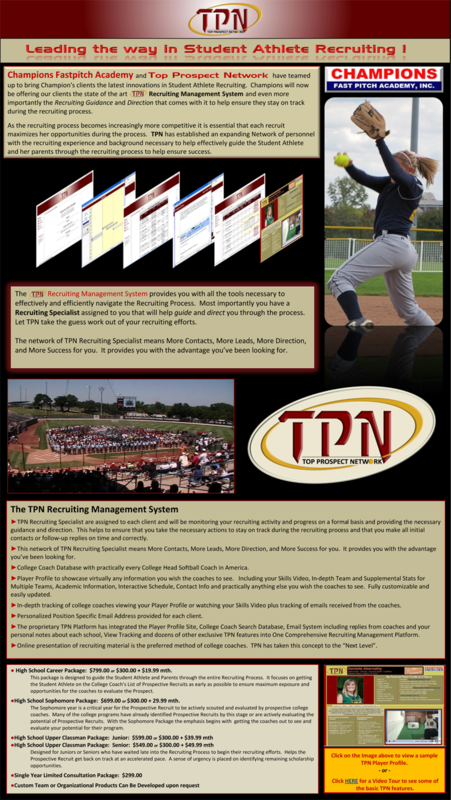 Champions will now be offering our clients the state of the art TPN Recruiting Management System and even more importantly the Recruiting Assistance and Guidance that comes with it to help ensure they stay on track during the recruiting process. Includes: Gold video & TPN with unlimited consultation. Thank you Stacy for sending us your Champions Elite Video. It is one of the best video productions that has come across my desk. Stacy, thank you for the video. You did a great job with the production. It is one of the best I have seen. Good luck and please let us know is there is anything we can do for you. Thank you so much Stacy for all you and your staff did to create Margaux’s video. She has had a successful career at Harvard and much credit is due to the skills video you produced for her. After being out much of the recruiting season with knee surgery it was pretty much all on the video to get her where she wanted to go. Thank you.